How to draw comics man face. This video tutorial will show you how to draw a muscular face. Below there is a step by step basic drawing from the video. 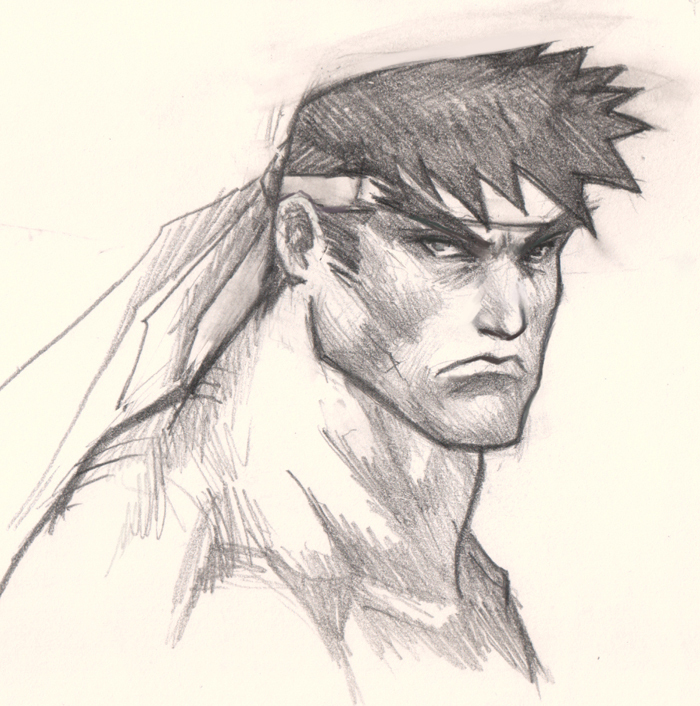 The process shows basic drawing and sketching stylize face of the character from Street Fighter. This tutorial will help you gain knowledge of stylized portrait drawing. 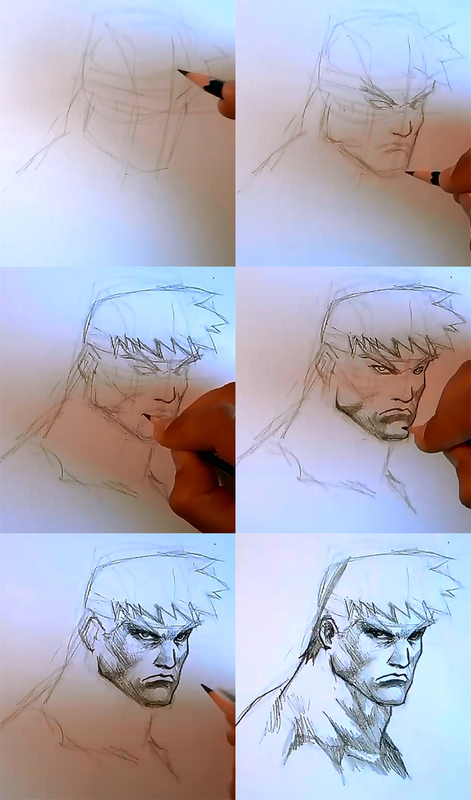 Learn How to draw comics man face, hero character, Ryu from Street Fighter. Ryu (リュウ Ryū) is the main character and “hero” of the Street Fighter series. Ryu has made an appearance in every Street Fighter game, as well as in every crossover fighting game with Capcom characters in it. Ryu has arguably become the most famous character in the fighting game genre, starring in early fighting games such as Street Fighter, but really got well known in Street Fighter II, where he was considered a “basic” character. Ryu is portrayed as a Japanese man whose basic, and most recognizable attire from the Street Fighter II timeline consists of medium-length brown hair, brown eyes, a long, red headband; a white karate gi with the sleeves ripped off at the shoulders, bare feet, and a black belt. Ryu’s first appearance in the original Street Fighter replaced the red headband with a white one and depicted him with bright red hair, gray eyes, and red slippers. In the Street Fighter Alpha series, Ryu’s hair became a lighter shade of brown, and he retained the white headband which hearkens back to his appearance in the first Street Fighter. Learn to draw comic book characters with tips from a professional concept artist and illustrator Xia Taptara. Step 1, I sketch out a basic geometry shape to define a head as seen in first image. I also draw in measurement horizontal line for eyes about half of the face height. Then vertical line to split the face in half and line up for the nose. Tip of the nose is located half way between eyes line and bottom of the chin. Mouth position will be half way between the tip of the nose and the bottom of the chin though mouth could be closer to the tip of the nose. Step 2, once I have all the construction of the face layout from step 1, I can now draw in eyes, nose and mouth onto the face. Easy to follow and you can use this step by step to watch along with the drawing video tutorial above. -How to draw Lara Croft Tomb Raider. Hi I love your drawings but they all seem to be older men. I was wondering if you could make a page on drawing young guys, such as teenagers. Thanks! Do you have a video on how to draw beards? If not… That’d be really cool if you’d make one! Beards like viking beards, Small beards, big beards, breaded beards…. Yeah that’d make me reeeally happy.